Have you ever wanted to meet the man behind the magical <?XML:NAMESPACE PREFIX = ST1 />land of Narnia? Now you can meet C. S. Lewis, the Oxford tutor and Cambridge professor who wrote the seven books: The Chronicles of Narnia. Learn what made the creator of the most beloved fairy tales of the 20th century the man who he was. Along the way you will visit all the important places of Lewis's life: from Belfast, Northern Ireland to the steps of the Parthenon in Greece and you will also meet some of Lewis's best friends, like J. R. R. Tolkien, author of The Hobbit and The Lord of the Rings. Your tour guide for this fabulous journey is Will Vaus, author of Mere Theology: A Guide to the Thought of C. S. Lewis, founder of three C. S. Lewis Societies, leader of a C. S. Lewis tour to England, and one of the few people in the world who actually lived in The Narnia Cottage in Ireland. Will stepped through the wardrobe door for the first time when he was 9 years old, and now that he has three sons of his own he knows how much every young person who reads the Narnia books or has seen the blockbuster Disney/Walden Media Narnia movies wants to know more about the author of these delightful stories, C. S. Lewis. So come along for the ride and you may even get to meet the great lion Aslan himself. "This is the perfect biography of C.S. Lewis for children... The boys and girls who read this biography will not only know how Lewis spent his time, but will know in their bones what it felt like to be the man whose dreams of lions led to the creation of Narnia." "Will Vaus has crafted a wise and winsome book sure to delight readers of all ages; Professor Lewis would be pleased indeed." "Finally there is a definitive biography of C.S. Lewis that will appeal to all the young fans of The Narnia Chronicles. Will Vaus has written Lewis's story interspersed with incidents from The Chronicles with just the right touch to answer all their youthful curiosity, and that includes the young in heart also." "A true Narnian and C.S. 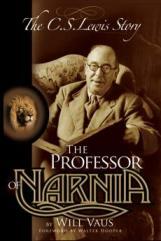 Lewis scholar, Will Vaus will delight everyone who reads The Professor of Narnia."